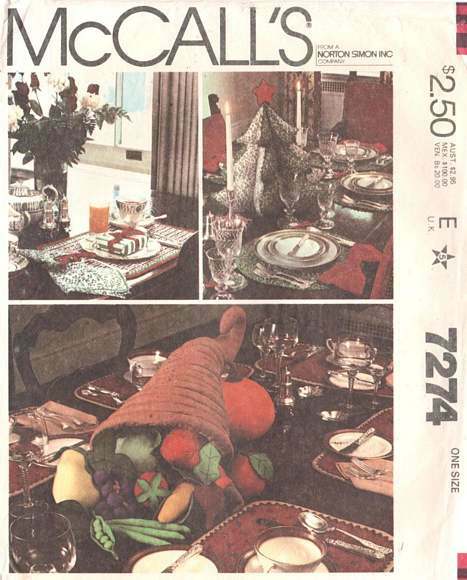 McCall's sewing pattern 7274 from 1980 for Christmas and Thanksgiving table setting items. (see additional photo below description). Stuffed Christmas Tree (17" high), Wreath Placemats, Napkin, Napkin Rings, Coasters. Cornucopia Horn (20" long) and a full variety of stuffed fruits and vegetables including corn, tomato, squash, cabbage, string beans, peas, pumpkin, beet, grapes, pear and apple. Pattern is uncut and complete. Envelope aged but solid.